This edition of News to Us shares several articles on pollution, both where we are losing ground and making some gains. Two stories provide updates on pending park improvements. Finally, take a look back at January’s weather in a piece that captures the month in numbers. Michigan rivers polluted by human, animal waste more than double previous estimates Occurrences of pathogen pollution have more than doubled in Michigan’s rivers and lakes in recent years. The new numbers are thought to be the result of better monitoring rather than marked changes in water quality. The problem is, and has been, widespread. Most of the waters impaired by pathogens (from human and animal waste) are located in southeast Michigan. Failing septic tanks, manure from farm fields, sewer overflows and polluted runoff are the leading contributors to the problem. Can sewage treatment plants protect fish from the chemicals in the water? Building on the story we published in the last edition of News to Us on trace chemicals in drinking water, Michigan Radio’s The Environment Report, covers potential impacts to fish from emerging contaminants – pharmaceuticals. Michigan: Thornapple River. Removing Dam Improves Dissolved Oxygen Levels in River It is not all bad news when it comes to water quality. Before and after monitoring data showed improved dissolved oxygen (DO) levels at the site of a dam removal. Prior to the removal of the dam, DO levels were so low, the river was listed as impaired under the Clean Water Act. The river will be delisted for its DO impairment. By the numbers: See how Ann Arbor’s cold and snowy January stacks up against history This is a fun look at this month’s weather. It uses Ann Arbor’s weather stations but similar numbers would apply across the watershed. Spoiler alert: It’s been coooold! Milford Village Council Approves Final Submittal for Phase I of AMP Project Milford is one step closer to making significant improvements its Central Park that includes an amphitheater for their summer concert series. 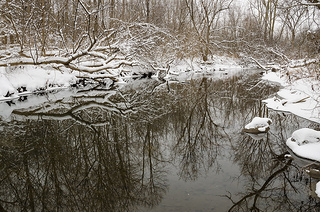 Pettibone Creek, a tributary of the Huron River, runs through this park. Milford is one of five Huron River Trail Towns. Next steps for Ann Arbor greenway project uncertain after grant funds denied A key parcel in the Allen’s Creek Greenway, did not receive state funding for improvements necessary to take it from a retired city maintenance yard to a welcoming civic space. The Allen Creek Greenway Conservancy and the City of Ann Arbor will be meeting to determine what the next steps for keeping the greenway project moving forward.